Looking back upon Finnish indie developer Housemarque’s titles, it’s clear that the studio always held designer Eugene Jarvis in high regard. 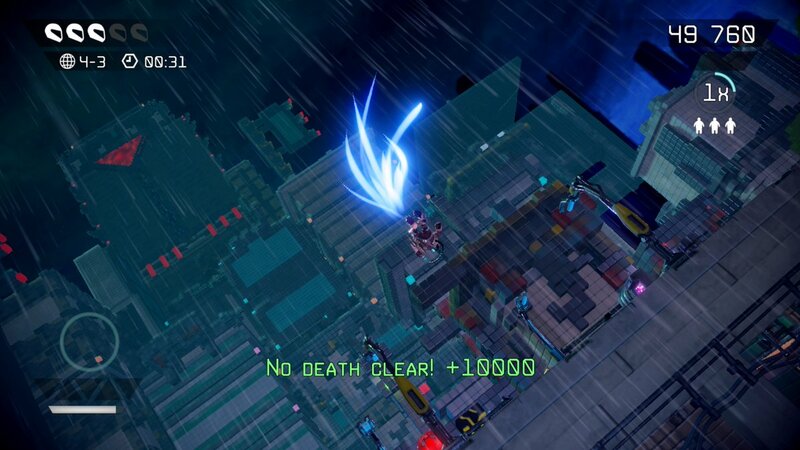 After all, their hit PlayStation 4 launch title Resogun was practically an HD version of Defender. That’s why it’s so cool to see the developer actually collaborate with the legendary game designer on Nex Machina, a twin-stick shooter in the vein of Jarvis’ Robotron: 2084 and Smash TV. Like classic twin-stick shooters, the core action in Nex Machina is as simple as pointing the right stick at enemies. That’ll send an endless barrage of bullets at the colorful baddies that pop into the world, and there’s no ammo management to worry about here. It manages to separate itself from its arcade counterparts thanks to some additional depth, which is found via a dash move, an upgrade system that makes the player more powerful over time, and powerful sub-weapons that have a cooldown between uses. Since Eugene Jarvis is a consultant on the game, it’s no surprise that a lot of his influence shines during the fast-paced action. Every world is made up of tiny levels, and within those players will be tasked with saving humans a la Robotron. This’ll net players extra points that are invaluable to the high score grind, and help add even more depth to the action. Those trying to save all the humans will have to carefully watch the remaining enemies, as they’ll be automatically transported to the next area if they kill every foe. It all comes together to create an incredibly fulfilling core gameplay loop that kept me constantly engaged. This is Housemarque’s best playing game to date, which is saying a lot. There main way to experience Nex Machina‘s content is by playing the arcade mode. This’ll unlock the game’s six worlds for other modes, and offers the ultimate high score chasing experience for players. The action is always challenging in the game (its title translates to “death machine” after all) thanks to the dozens of enemies that are usually on-screen, but there are several difficulty options to choose from. These range from having unlimited continues (the regular difficulty gives the player 99) and higher difficulties will not only cut down on the number of lives a player has, but will also make the enemies move faster and fire bullets after dying. There’s plenty of reason to keep replaying the game’s arcade mode after the first time it’s completed. The two other modes are better suited for shorter sessions (as a full playthrough will take over half an hour to complete). Arena is the most fully featured of the two, as it has players earning medals based on their performance, and they can use these trinkets to purchase even more in-game challenges. These are very difficult (such as racking up 500,000 points in a level in under four minutes), and it becomes a pretty long grind to unlock new ones. Finally, there’s a mode where players can just choose to play a world and then try to make the rankings. It’s a bare bones score chase, but it works well inside the game. I mentioned earlier that levels often feature dozens of enemies chasing the player at once, and this is often paired with bullet hell scenarios later in the game. Players will have to shoot their way through hordes of enemies all while dashing through lasers. 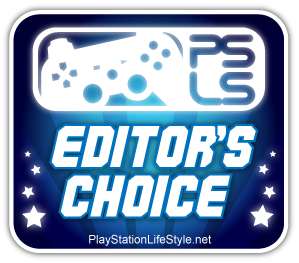 It’s an incredibly intense experience, and one that is matched by some of the most impressive visuals on PlayStation 4. The game’s particle effects really popped on my television screen, and I took way too much joy in watching the end of world boss explode after an enthralling encounter. This intensity is further matched by the game’s upbeat soundtrack, which is once again composed by Ari Pulkkinen of Resogun fame. 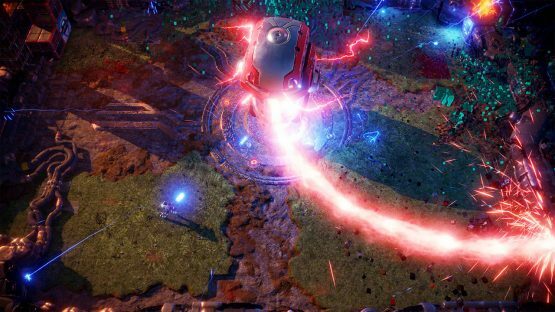 One of the coolest features that Nex Machina offers up is local cooperative play. This can get pretty tricky at times, as the screen is already chaotic when playing solo, but I had a blast working together with a partner on the lower difficulties. Deaths are shared between two players, and the screen will zoom out whenever they are far apart in order to avoid any split-screen action. It all works very well, although I feel that the higher difficulties would require a lot of cooperation to be played well. There are some disappointments that come with the co-op mode, though. In a very baffling move, the second player in co-op is colored red. This becomes a major issue since all the enemies are the same color, and it becomes very difficult to spot the second human running around. Hopefully this will get patched, as my inexperienced partner often struggled to find themselves on the screen. It’s also worth mentioning that there’s no online play, although their decision to not include it makes sense when you consider how any lag would automatically ruin a match. As someone who spent way too many quarters as a kid trying to top the high scores of others, I’m glad I don’t have to constantly put money into Nex Machina. Eugene Jarvis and Housemarque have come together to create one of the best playing twin-stick shooters ever made. While I do wish there was more content (I can only hope this gets the same amount of support as Resogun did) , there are enough difficulties that I’ll still be learning the intricacies for several months to come. Review code for Nex Machina provided by the publisher. Reviewed on PS4 Pro. For more information on scoring, please read our Review Policy here.